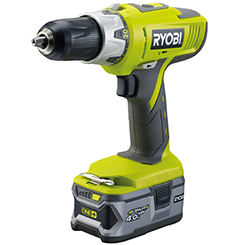 RYOBI® have been setting the pace in the manufacture and supply of high quality, affordable DIY power tools for over 20 years. Their focus is to help you work efficiently, safely and comfortably in both your home and garden. My Tool Shed aim to deliver innovative tools loaded with all the right features. Breaking the cordless power tool market, they have introduced a large range of interchangeable tools called “One+”. A single 18v Lithium Battery that is capable of powering a family of tools. Removing the added expense of buying unnecessary chargers and batteries with every tool purchase. We want you to get the most from this brand and our catalog is vast, expanding across Cordless Drills, Drivers, Saws, Sanders, Grinders, Nailers, Garden Power Tools and more. For professional or serious home use, in the workshop or in the garden, RYOBI Tools represent unbeatable value for money. But that’s not all, they offer excellent quality control right down the line, backed up with a 2 Year Warranty, so you can enjoy peace of mind with your purchase today.